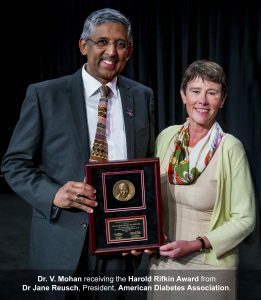 Dr V Mohan received the American Diabetes Association’s 2018 Harold Rifkin Award for distinguished International Service in the Cause of Diabetes. Viswanathan Mohan, MD, PhD, received the American Diabetes Association’s® (ADA’s) 2018 Harold Rifkin Award for Distinguished International Service in the Cause of Diabetes. This award honors individual outstanding service in the cause of diabetes, performed with an international perspective and with international impact. Dr. Mohan was recognised with this honor at the ADA’s 78th Scientific Sessions, June 22-26, 2018, at the Orange County Convention Center in Orlando. Internationally renowned, Dr Mohan works tirelessly to address the challenges of diabetes in India and developing countries. He is actively involved in Indian Government health policy and advocacy programs related to diabetes, and he has served as President of the Research Society for the Study of Diabetes in India.